BinaryTilt is an award winning London based broker. They have an incredible offering including a definitive Trading Hub for resources and education, a selection of 9 platforms to choose from, a bonus of up to 100% and over 150 assets to select from. It is clear that this broker has invested deeply into their resources and product, which is always a good sign when selecting a broker to work with. BinaryTilt is a binary options online broker operating out of London. The BinaryTilt brand is owned and operated by Chemmi Holdings Limited (Company number: 9870892). BinaryTilt operates with a proprietary platform and commenced operations in 2013. BinaryTilt was voted the 2016 Best Broker with Overall Customer Satisfaction by BinaryOptionsWire, an independent binary options online news organization. BinaryTilt is relatively new in the industry, but it is already building a solid reputation for itself in the binary options online market. We present a BinaryTilt review, covering various aspects of this non-scam binary options online brokerage operation. On review of the asset listing on BinaryTilt, over 150 assets are seen to be listed for trading on the proprietary digital option platform. These assets are spread across four different asset classes as shown below. Forex: AUD/CAD, AUD/CHF, AUD/JPY, AUD/NZD, AUD/USD, CAD/JPY, EUR/AUD, EUR/CAD, EUR/CHF, EUR/GBP, EUR/JPY, EUR/NZD, EUR/USD, GBP/CAD, GBP/CHF, GBP/JPY, GBP/RUB, GBP/USD, NZD/USD, USD/CAD, USD/CHF, USD/JPY, USD/RUB, USD/SGD, USD/TRY, USD/ZAR. Stocks: Cisco, Caterpillar, AIG, Adidas, Airbus, 3M, Alibaba, Axis Bank, AXA, Apple, Baidu, Banco Santander, Coca Cola, CitiGroup, BHP, Bayer, BNP Paribas, Google. BinaryTilt provides trading bonuses to its traders. Bonuses available on BinaryTilt are calculated as a percentage of the account capital deposited for the first time into a live account. BinaryTilt gives its traders the opportunity to negotiate for the bonus percentage to be awarded, up to a maximum of 100%. It must be said that BinaryTilt provides terms and conditions on the usage of bonuses on its platform. Bonuses are not suitable for all categories of traders. BinaryTilt makes this point very clear, unlike other brokers that do not mention this fact. Bonuses are to be used as trading capital and cannot be withdrawn under normal conditions. In order to be able to withdraw a bonus, certain trade volume requirements must be met. The broker will stipulate what trade volumes you need to meet when you apply for a bonus. In addition, no non-bonus capital can be withdrawn until the trading turnover requirements are met. Bonuses are awarded irrespective of the account type the trader operates. There are no specific VIP-level options. BinaryTilt has a strong presence on mobile. The company presents mobile trading apps for traders to trade binary options online with. The mobile apps can be downloaded from the Google Play store and are compatible with Android smartphones and tablet devices. Credit card/debit card: With VISA and MasterCard brands being the only two card brands accepted on the BinaryTilt platform, traders are assured of an instant way of funding their accounts with a minimum of $50. Withdrawals may take up to 5 days. The bank wire transfer method can be used to deposit funds on the BinaryTilt platform. The minimum deposit amount is $100. Transactions on the deposit and withdrawal side may take up to 7 days to conclude, making the bank wire the slowest method of transaction on the BinaryTilt platform. E-wallet options: The only digital wallet that is accepted on BinaryTilt is that of Skrill. The advantage that Skrill presents is that it integrates with at least 100 other payment methods. Therefore, usage of Skrill means that the trader can deposit and withdraw funds with other methods such as Payoneer. The minimum transaction amount is $50. Deposits and withdrawals are concluded within one hour. Here is a list of the minimum deposit amounts in the various base currencies that feature on BinaryTilt. The transaction processing times of BinaryTilt is comparable to what is obtainable in the industry. There is a live chat which is available 24/7, 5 days a week. Email: Various email addresses exist to enable traders reach BinaryTilt on specific issues. For general support however, the email [email protected] is very active. Phone: Traders can reach the London office of BinaryTilt on +44 203 807 1553, and the Manchester office at +44 161 394 0459. The quality of the customer support on BinaryTilt is simply exceptional. Traders can use a variety of extra features and resources to enhance their trading experience on BinaryTilt. Traders get a binary options online demo account, which is restricted to those who have made deposits into a BinaryTilt demo account. The demo account can only be used for a limited period of time. A compendium of trading strategies is provided as part of the educational suite. 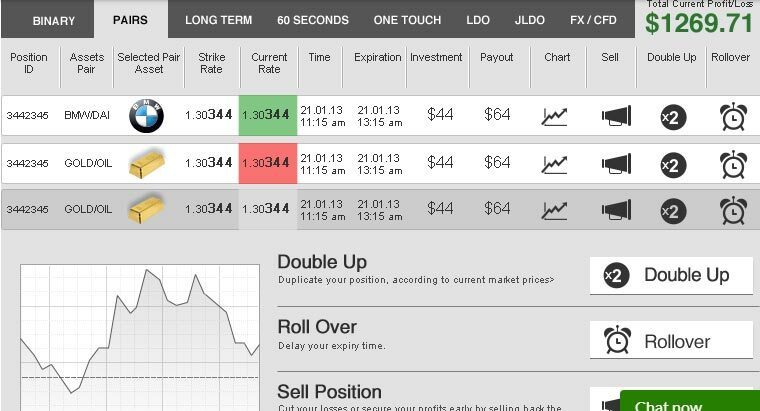 The Roll over function is used to delay the expiry time so as to allow the trade the opportunity to end in the money. Traders are also given the Sell Position feature, which enables traders to close positions earlier than the pre-set expiry time. This is done to cut losses or to take some profits early. There is an opportunity to make extra money using the BinaryTilt partnership programs. The partnership programs feature an affiliate program, an introducing brokerage program as well as a Refer-a-Friend bonus program. Traders can also use the Double Up feature to double an existing investment on an asset which is clearly on a trending roll. For the first time, a binary options online broker offers the opportunity to make deposits and withdrawals using Bitcoin. BinaryTilt is a relatively new binary options online platform, so it may be too early to give an objective analysis of whether the binary options online brand is performing according to expectations or not. In a market with little regulation, there has been a hefty influx of brokers who are more or less bucket shop companies. Thanks to strengthening regulation, many of these brokerages are closing shop. However, others from other jurisdictions are taking their place and this is where BinaryTilt has found itself. BinaryTilt has an exceptional customer service desk, which is ever present and ready to answer all requests that prospects and active traders on the platform may have. There are several trade types, which allow the trader the flexibility to bet on different kinds of binary options online. Some binary options online robots use BinaryTilt as their preferred broker. If you have access to such robots, then you can trade on BinaryTilt in an automated manner. Perhaps the only thing working against BinaryTilt is that it has not secured top regulatory status. Presently, it is still under regulation from the UK Gambling Commission. The company needs to work on securing top regulatory status from other well recognized jurisdictions. Is BinaryTilt a reliable broker? BinaryTilt is a very reliable and efficient binary options online broker. What can I trade on BinaryTilt? On BinaryTilt, you can trade close to 150 assets covering stocks, currencies, commodities and indices. What trade types are found on the BinaryTilt platform? The following trade types are found on the BinaryTilt platform: Pairs, Long Term, Ladder, One Touch, 60 seconds and CFD/FX binary options online. I am a social media freak. How do I connect with BinaryTilt on social media? BinaryTilt has a strong social media presence. You can connect with them using the Facebook page () or hook up with them on Twitter (). There is a YouTube channel as well. I don’t like using my card details online. What options do I have in terms of making a deposit on BinaryTilt? BinaryTilt offers a wide range of deposit and withdrawal options that do not involve the use of credit cards. These are digital wallets and bank wires. BinaryTilt does not accept third-party payments. All deposits and withdrawals must emanate and terminate on the account owner’s payment channel, bearing the same name as the BinaryTilt trading account owner. Is BinaryTilt a scam broker? BinaryTilt is not a scam broker and there have been no scam reports against this broker.